In this image-mosaic (approx. 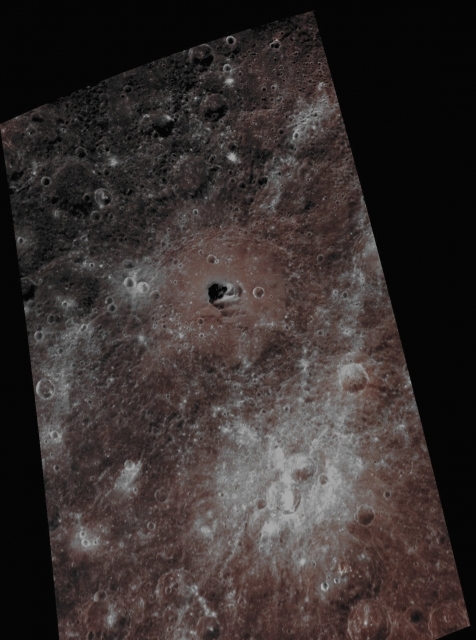 290 Km - such as about 180,09 miles - across), made out of three frames taken by the NASA - MESSENGER Spacecraft on July, 15, 2014, we can see, in the upper central position of the picture, the Mercurian Impact Crater named Hemingway, in Absolute Natural Colors. Hemingway Crater is approx. 130 Km (such as about 80,73 miles) in diameter, with a relatively pale orange/brown Floor and a very unusually-looking patch of very dark Material (whose origin and composition are still unknown) deposited in its center. This Impact Crater, if you pay special attention to the details, shows several irregular Depressions on its Floor, which are fairly common in other Mercurian Impact Craters and that may be due to the occurrence, in a very remote past, of Explosive Volcanic Events; however, the Low-Reflectance, Dark Patch of Material very well visible on its Floor may also point to a more complex Geologic History of this Feature (which, unfortunately, we may never be able to fully reconstruct and understand). Just out of curiosity, and no matter how unusual it may seem, no Hollows are visible inside or even near (---> in the closest proximities) of Hemingway Crater. This picture (which is an Original NASA - MESSENGER Spacecraft's false colors and Map-Projected image-mosaic published on the NASA - Planetary Photojournal with the ID n. PIA 18808) has been additionally processed, contrast enhanced, Gamma corrected, magnified to aid the visibility of the details and then re-colorized in Absolute Natural Colors (such as the colors that a human eye would actually perceive if someone were onboard the NASA - MESSENGER Spacecraft and then looked outside, towards the Surface of Mercury), by using an original technique created - and, in time, dramatically improved - by the Lunar Explorer Italia Team. Different colors, as well as different shades of the same color, mean, among other things, the existence of different Elements (Minerals) present on the Surface of Mercury, each having a different Albedo (---> Reflectivity) and Chemical Composition.